An eastern New Orleans icon of post-Katrina abandonment is up for the taking. 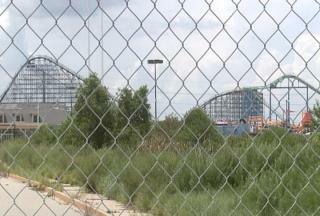 After nearly six years of handwringing over the future of the city-owned former Jazzland/Six Flags theme park, the city put out a call Wednesday for companies to submit proposals for the redevelopment of the 276- acre site bordering Interstate 10 on Lake Forest Boulevard. The roller coasters come with the winning bid, if a developer wants them. Photo courtesy of FOX 8. Now a graveyard of rotting trinkets and rusting rides, the amusement park could be reinvented as another amusement or water park, a back lot for the film industry, a shopping center or some other commercial use. The city will not consider residential uses, the request for proposals states. Before Katrina, the amusement park never attracted as many guests as operators anticipated. It never reopened after the storm, and, in its decay, has become a cult destination for thrill-seekers. The agreement that Six Flags signed with the city when it terminated its lease last year made the city the owner of all the park’s rides – a fleet of 20 that includes four roller coasters overlooking I-10, a moldy flume ride and a partially ransacked merry-go-round decorated with paintings of New Orleans jazz musicians. If a developer doesn’t wish to incorporate the neglected rides into its plan, the city will remove them, as well as any unwanted buildings, according to the request. Other help in the form of city or state subsidies for the redevelopment may be available as well, the request also notes. Six Flags, which owns more amusement parks than any other company in the world, bought the $135 million Jazzland park out of bankruptcy protection for $22 million in 2002. The park had been open only two years before succumbing to bankruptcy. Despite investing millions into modernizing the park, the Texas-based amusement giant never managed to meet its goals for attendance. Katrina was the final blow for the ailing park, and in 2010 Six Flags terminated a 75-year lease on the property while undergoing its own bankruptcy reorganization. The lease termination called for Six Flags to pay the city $3 million in addition to 25 percent of its net Katrina-related insurance proceeds if the proceeds exceed $65 million. The city could not immediately say whether Six Flags has paid these debts. In the meantime, the city still owes the U.S. Department of Housing and Urban Development $13 million for loans taken out to build the park in the 1990s. The city, under the leadership of then-mayor Marc Morial, invested more than $25 million in building out Jazzland. Morial expected the park to bring other private investment to the area, but that never materialized. Today, most of the site is empty and in the past year, the city has spent at least $240,000 securing it. Proposals for the site are due to the city by Oct. 10. If the city doesn’t identify a developer able to reopen the site as an amusement park, it has the option to auction it to a private bidder, according to an authorization approved earlier this week by the Industrial Development Board of New Orleans.